Early this morning I heard from Sue Henon at Palmengarten, that yesterday evening until very late, she was getting in touch with loads of hotels in Frankfurt to try and find an affordable one for the duration of the strike. Apparently, as many people were out on the same quest, hotel prices were escalating rapidly. Eventually she found one in an area that wasn’t the best (every city has one), which she could afford. Hopefully it will be comfortable. Sue tells me that the strike starts at 02:00 and lasts until 02:00 Monday morning. You may remember she takes her one day a week break on Monday, but luckily she has managed to get a lift home on Sunday evening after the exhibition closes for the day. But as Sue will not be going home and won’t have access to a computer, I doubt that we will have any updates about the exhibition until Sunday evening at the earliest. However, if I get any news I will post it. In the meantime I intend to continue with posting the pictures I have from the exhibition. On a personal note, today I had my normal weekly class. I am so lucky as there are six students who get on so well together. Four of them use watercolour and two coloured pencil. I do enjoy the class and their involvement in it. This afternoon I have been marking assignments. I’m afraid that I haven’t got very far as the first two were completing the course. I therefore feel it, important to give a very full feedback so that they can continue working on their own. 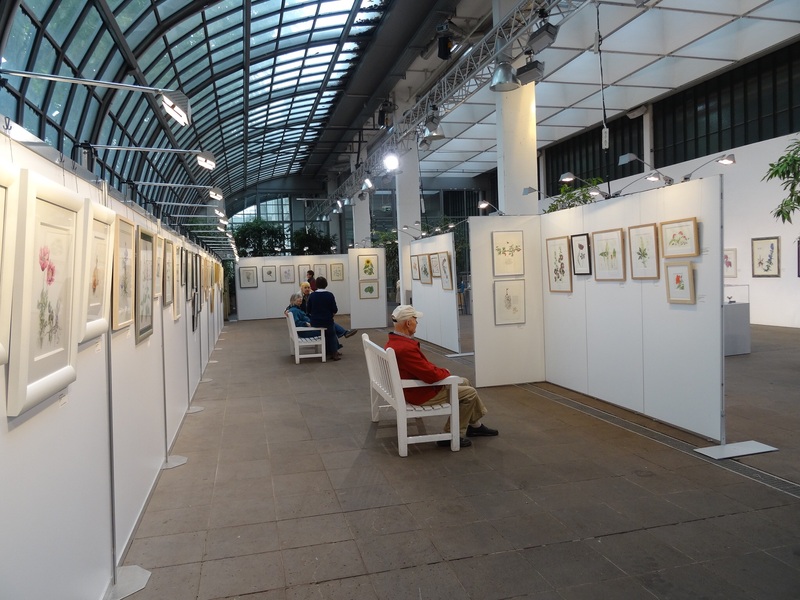 But if I can get more people interested in botanical art- so much the better. Now the pictures. I wonder how many actually read what I have written, or just go through the pictures? Artwork by Jenny Jowett & Vivien Burgess. The outside wall of the Palm house looking up away from the reception area. A sneak preview before the e Hinton opened. Interst already. More gorgeous artwork. I particularly love the orchid painting on linen by Sarah Caswell. My gosh. Don’t tell you thought it was an orchid. I am sure it was a slip of the tongue and you knew it to be an Iris! It’s a red dotted one.